In honor of St. Patrick's Day, I present you with Corned Beef Loaf! This recipe comes from The New Jell-O Book of Surprises, as in "Surprise! 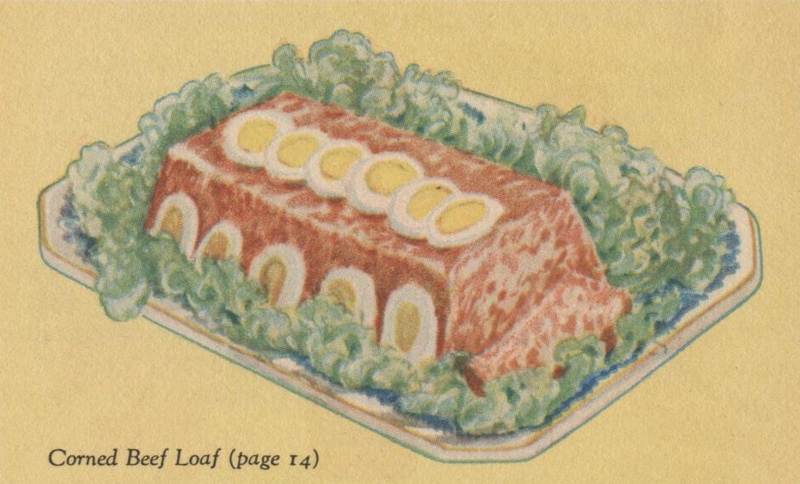 There's Jell-O in your meatloaf!" 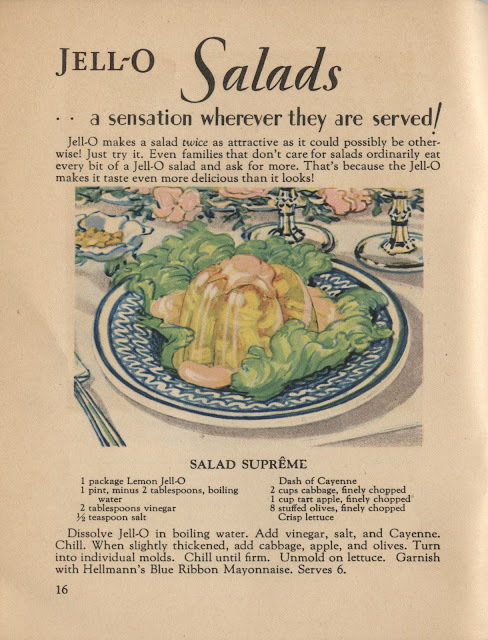 Salad Suprême doesn't sound too horrible. I might be brave enough some day to try it! Nasty Jell-O of the Month is sponsored by its creator, Emily, whose blog is Livin' Vintage. Thanks, Emily! Oh I love Bing so! Ah, nothing quite like St. Pat's Day in Salt Lake City! Much as I usually would say "there's always room for Jello," this may be the exception. I love Bing Crosby, too. 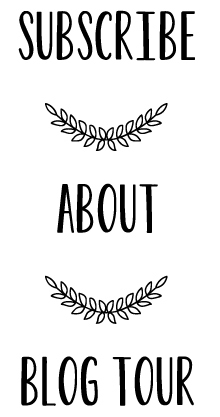 Have you ever read Perfection Salad, by Laura Shapiro? I think you would like it. 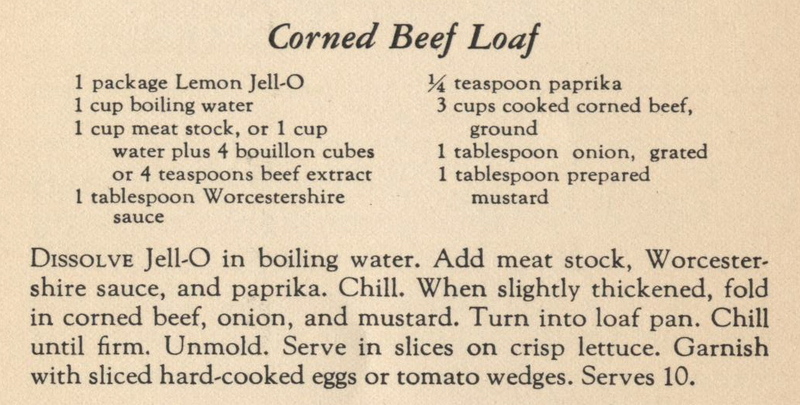 hmmm, Lemon jello=in the meat? Was it tasty? I'm hesitant!! Baroness- I'm not brave enough to try it! Laura- I saw that book the last time I was at the library and didn't get a chance to look at it; I'll have to go back for it. And it looks so pretty in the picture! Can it be any worse? I took a nice break listening to Bing. I'm as gonzo for weird jello recipes that are secretly delicious as anyone but....corned beef jello!! Yikes. The Crosby quadruple action has almost cleansed my mental palette, but still. GOOD LORD. 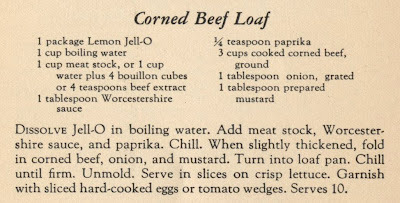 Beef and jello...it's just wrong. Thank you for bringing this atrocity to my attention. oh, lord. i can't even imagine what those taste like! thanks for the Bing to wash it away. Ooooh,that is a nasty jello. I love Bing though!